This RV Vacation took us to southeastern Oklahoma and southwestern Arkansas, to the mountains of the Ouachita National Forest. The beautiful Talimena Scenic Drive along the Winding Stair Mountains range was well worth the days drive for the round trip. We enjoyed camping and hiking in the Oklahoma and Arkansas State Parks and in the National Forest Campgrounds. Except for the unexpected arrival of an uninvited guest (Hurricane Rita) at the end of our trip, it was a nice escape from the flatlands of Houston. Sunday, September 11th, we left Richmond around 5:00 PM, northward via US-59. We drove to Leggett, TX to Eagles Rest RV Park for the night. The park was well-equipped and the owner and manager were very helpful. Monday morning we continued north on US-59 to Nacogdoches where we switched to US-259 and drove to Idabell, OK. We stayed at Green Acres RV Park. It is a well equipped park but the name was a little misleading - no Eddie Albert. 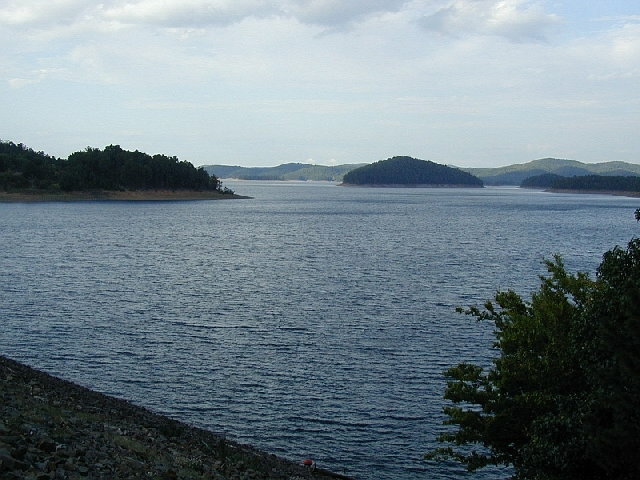 Tuesday morning, we continued north on US-259 to Broken Bow, OK. We made our camp at Beavers Bend State Park and Resort, a few miles north of Broken Bow. 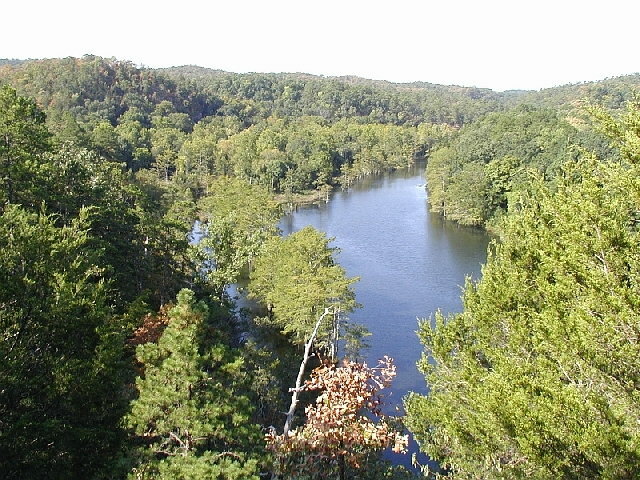 This 7,200-acre park borders Broken Bow Lake and the Mountain Fork River. It contains a lodge, cabins, 4 RV campgrounds, golf course, 2 museums and numerous hiking and nature trails. Our campsite was located along the banks of the Mountain Fork, a few hundred yards from a low water dam - very peaceful. We arrived in time for a hike along the South Park Trail - a steep and rocky 2-mile trek from the campground to Beaver Creek and back. Wednesday morning we hiked along the Cedar Bluff Nature Trail. This was another one of the many challenging trails that offer a good scenic reward along the way. It involved some steep climbing and some creek crossings. In the afternoon we hiked along the Beaver Lodge Nature Trail - also a little climbing but mostly quite easy - one mile to the spillway, then back. 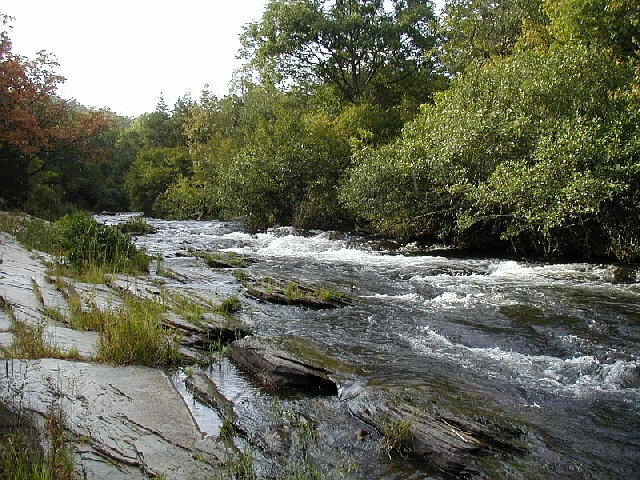 It follows the creek that flows from the spillway on the dam of Broken Bow Lake. The creek is beautiful fast water flowing over rocks. Thursday morning we hiked the Beaver Creek Trail - flat and easy - along almost dry Beaver Creek. It was 1 mile to the junction with the Lookout Mountain Trail. We hiked partly up that trail, but it was too hot and steep, so we returned to the campground. 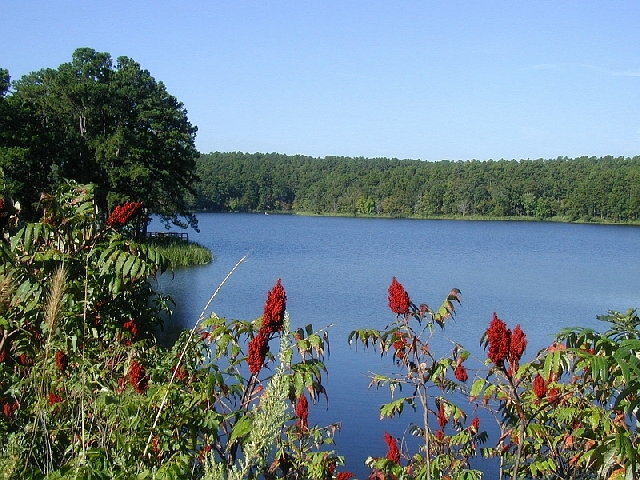 After lunch, we left Beaver Bend Park and drove north on US-259 to Cedar Lake Campground in the Ouachita National Forest. 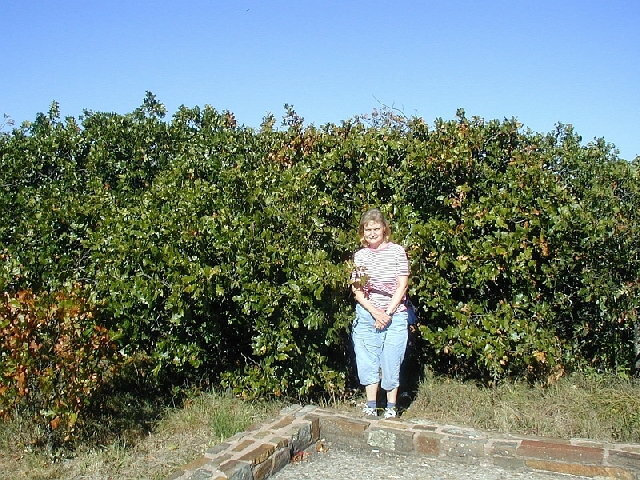 Friday, September 16th, we left the trailer in the campground and spent the day driving along the Talimena Scenic Drive from the western extreme in Talihina, OK to the eastern extreme in Mena, AR and back - a distance of 54 miles each way. 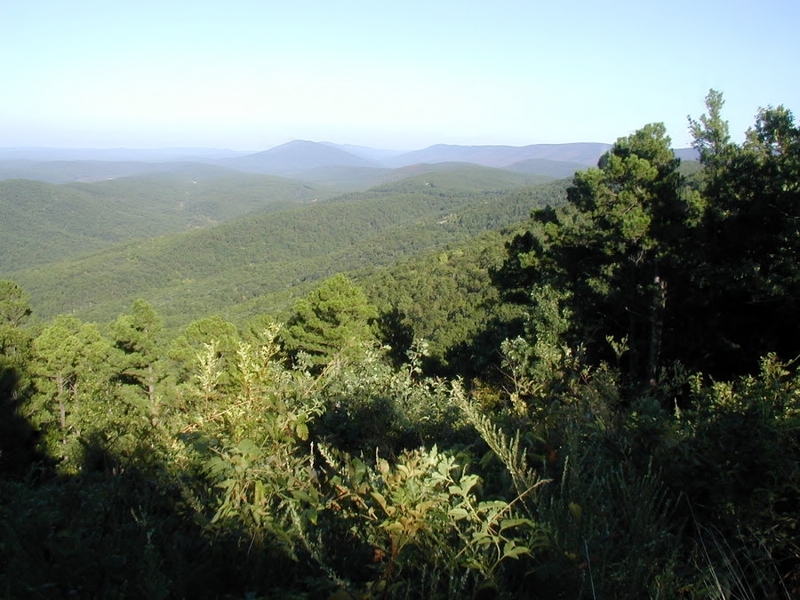 This is an outstanding route along the top of the Winding Stair Mountain range, one of the highest ranges between the Appalachians and the Rockies. There are 26 scenic overlooks along the way. 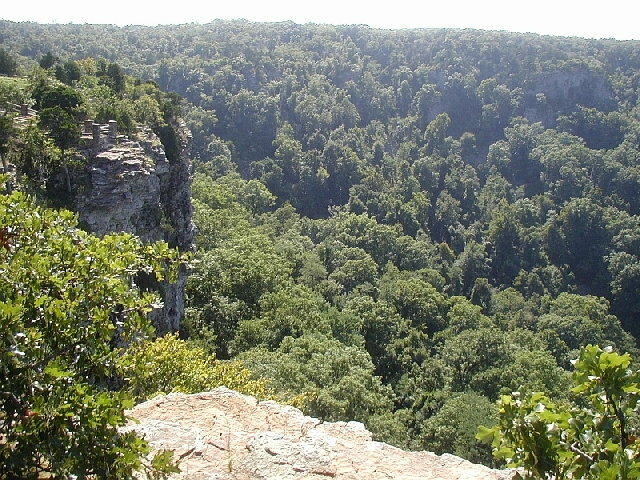 It runs through Queen Wilhelmina State Park in Arkansas. We stopped and ate lunch at the Lodge - very good buffet. It was significantly cooler Saturday morning after a cold front came through. We spent the morning hiking around Cedar Lake on a trail, a distance of 3 miles. After lunch we did some sight seeing in the area. First, went toward the town of Heavener, OK to tour the Peter Consor house. 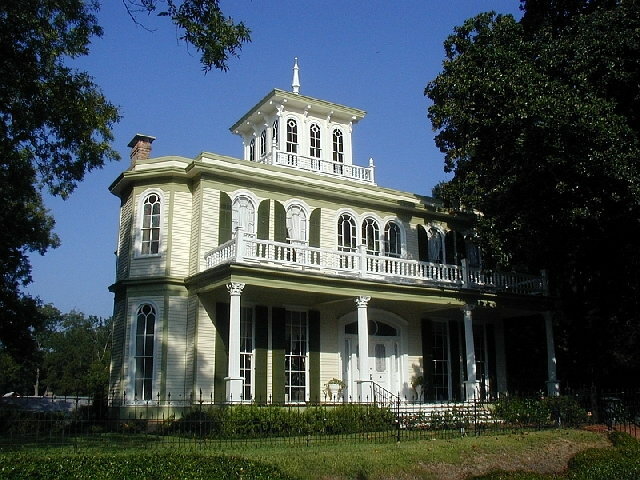 Consor, part Choctaw, built the house in 1894. The custodian was very friendly and informative. Afterwards we drove into Heavener, OK to Heavener Runestone State Park. The Runestone is a large natural stone with carved markings supposedly made by Vikings who had sailed around Florida and up the Mississippi, Arkansas and Poteau Rivers to this site between 600AD and 900AD. 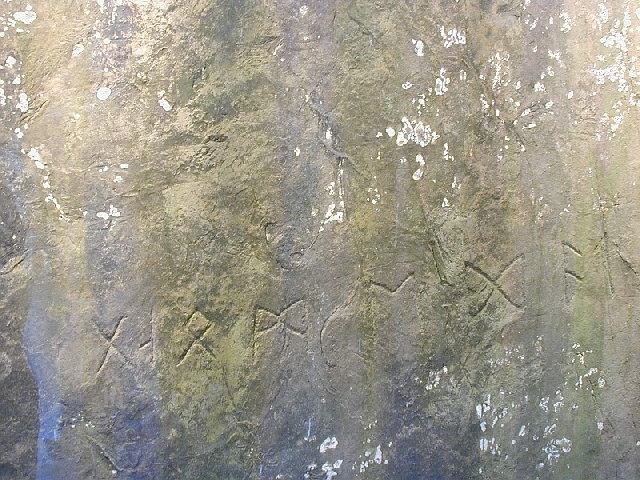 The story of how these markings were deciphered is interesting. We left there and drove to the Kerr Country Mansion, Conference Center and Museum. It is the former home of Senator Robert Kerr of OK. Several former presidents have stayed there and the doors to their bedrooms have a plaque telling who stayed in the room. The lady staying in the LBJ Room allowed us to look about that room. We did not get to see any other rooms because they were occupied and we didn't meet the occupants. The house is perched on top of a hill with a commanding view of the countryside. Sunday we spent the morning at the Cedar Lake Campground watching a church service on TV and relaxing. 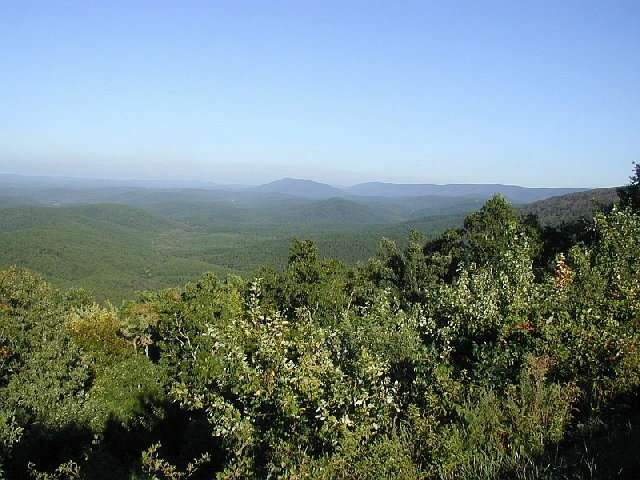 In the afternoon, we pulled the trailer into AR to the Queen Wilhelmina State Park, atop Rich Mountain. After setting up in our campsite, we went into Mena, AR to do laundry. The sign on a building downtown said that Mena was the home of Lum n' Abner. Monday we started out the day with the breakfast buffet at the lodge. Afterwards we hiked the Lover's Leap Trail, which makes a loop that returns to the lodge. While on the trail we encountered some people repairing the trail. They were all members of a hiking club who were spending a week as volunteers working on the trail in exchange for room and board at the lodge. In the afternoon we stayed around the trailer and sat out in the shade and read until about 3PM, when we went back to the lodge to look at pictures and newspaper articles representing some of the history of the lodge. After supper we went back to the lodge thinking it might be a good place to view the sunset. It wasn't but we spent some time talking to one of the hiking club members who was one of those working on the trail. He gave us some good information about hiking equipment. Tuesday we left the trailer and drove north about 50 miles to Mount Magazine State Park. 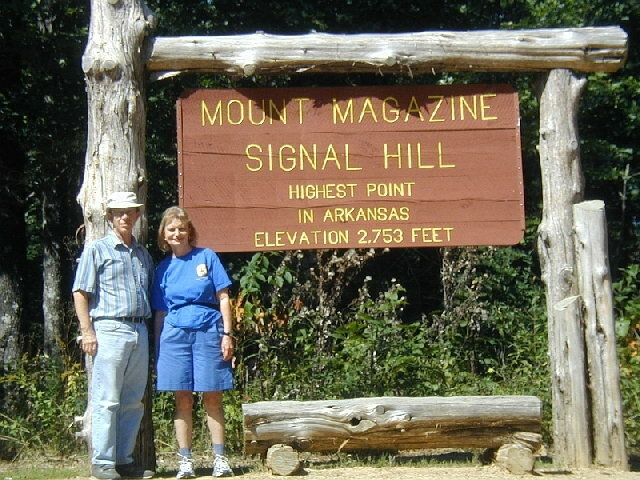 Mount Magazine, at 2,753 feet is the highest point in AR. The park has RV campsites and an enormous lodge under construction. We walked the short ½ mile trail from the road up to the summit. We then drove around the park before starting back to Queen Wilhelmina S.P. Wednesday the 21st after breakfast we walked the Spring Trail - approximately ½ mile of fairly easy walking. When we returned from hiking we called one of Lawson's friends back in TX. After hearing about the hurricane threat (Rita) to Houston, we decided to cut our trip short and start back home. After lunch we hooked up the trailer and drove south to near Marshall, TX to spend the night. We began seeing the news on TV of the Houston evacuation so we changed our plans and decided to stay where we were until the hurricane decided where she was going. Thursday morning we had to move to an RV Park in downtown Jefferson, TX because it was the only vacancy in the area. It was a very small park and we were crammed in with folks fleeing from the Beaumont, TX area. Everyone was keeping an eye on Rita. That campsite worked in our favor because we were within 2 or 3 blocks of everything we needed. We were able to walk to everything except the grocery store and laundromat. Friday we walked to the library to check our email and then walked around town some taking pictures. The Chamber of Commerce gave us some information about what to see and do. In the afternoon we went to the laundromat. Then we walked around town a little more and checked our email again at the library. Saturday Rita arrived on the scene. It began to rain about 6:30AM and rained all day as the remnants of Rita came through. There was some high wind and we watched the big pecan trees in the yard next to us swaying, but no damage. By evening the storm was pretty much over for us. We were told a tree blew over into a house in another part of town, but Jefferson escaped the worst. Sunday we went to church at First Baptist Church in Jefferson. It was pretty small and had a traditional service. We spent the afternoon in the trailer reading and napping. We started taking a walk after supper, but it was so hot we cut it short. Some people in the park had started home, but we decided to wait until the roads were clear of traffic from all those returning and there was plenty of gas. 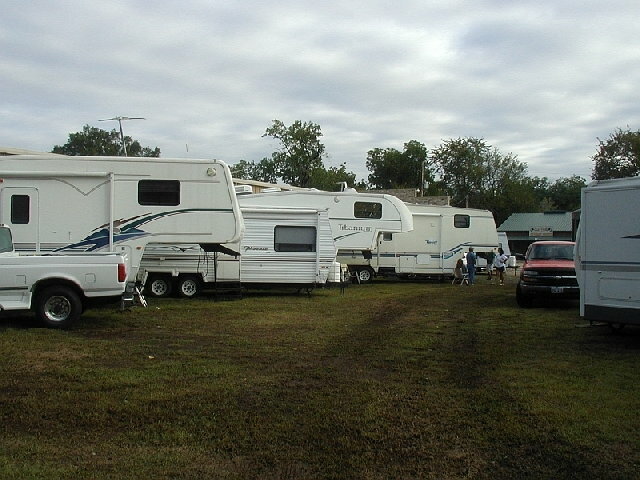 Several of our neighbors in the RV park were from areas hard hit and did not know the status of their homes. Monday we took a walking tour of some of the old houses. There are many bed and breakfasts here. We ended up at the library, but their Internet was down so they sent us to the Texas Workforce Commission to use their computers for checking our email. After checking our email we walked through a couple of antique stores and the Blackburn Syrup outlet store on the way back. After lunch we rested a bit and then did some shopping. Tuesday morning while it was cool we walked around town some more to look at more old homes. There are so many here. The library's computers were still down, so we went back to the Texas Workforce Commission to use theirs. Then we walked around town some more before lunch. After lunch we went back to some of the antique stores. Wednesday, September 28th, we drove back into Houston without any trouble. This draws to a close our Oklahoma & Arkansas RV trip. We hope you enjoyed the pictures and brief descriptions of our activities. We are very thankful that our home in Richmond, and our neighbor's homes were spared by Hurricane Rita.